Today Bioware opened up limited server transfers for players of Star Wars The Old Republic (SWTOR) and the options are rather limited. I believe that this is by design and represents just the first step in a larger plan. If you have a character on a low population server, you are allowed to buy a one-way ticket to a higher population server. 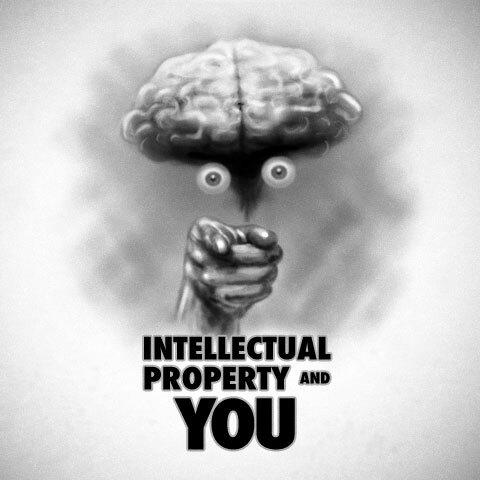 And by "buy" I mean they give it to you. These transfers are free. Bioware takes several opportunities to remind us of a couple of things. First, that options may open up in the future (e.g. selectable destination servers) and that extra functionality may come at a cost. Personally, I'm perfectly fine with that and not particularly surprised. I have been "lucky" enough to have created characters on not one, but two of the low population servers that we are being given the opportunity to leave. Since I'm guildless in all cases (someone adopt me, please) I thought I would walk through the steps and give those curious about the process a taste of what they can expect. I will go light on exposition and let the pictures do most of the talking. Starting out I logged into SWTOR and you can see that I have four characters total spread out among three servers. Here is who I want to move. Darth Thom Macshadey of Hedarr Soongh. Let's do this thing. 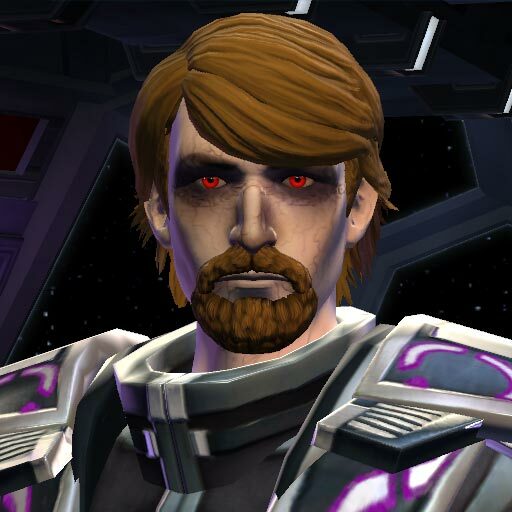 Go to the "My SWTOR" section of the SWTOR site and log in. Once logged in, click on the "My Account" link. On the left-hand side of the page, click the "Character Transfer" link. You will be shown information about the transfer process as well as the requirements. At the bottom of that page you will find a list of valid transfers. As you can see, I have two options available to me. I will click the "Pre-Select Servers" button next to the Hedarr Soongh option. You will be asked to select a character. Once you do, the destination servers list will update itself. As you can see, we only have one option: the infamous Fatman server. With the destination selected, click the "Next" button all the way at the bottom of the page. A check will be performed... we passed! Click that "Start Transfer" button. Here is your notification that something has been started. You will also get an email. Then I checked the transfer listing. Darth Thom must have left Hedarr Soongh because that option is no longer available to me. Another check of my character transfer history showed me that everything was done. Elapsed time? Two minutes. Heading back to SWTOR the server listing now shows that I have two characters on Fatman. That's odd. Once logged in, we see only the one. Good ol' Darth Jkbgghxcttsofmr. 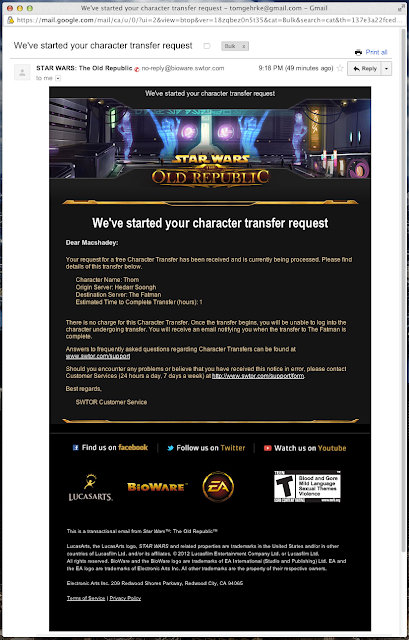 Bioware changed my name. Again, not surprising. Selecting the character and attempting to proceed to play brings up the rename dialog. Let's try to change it back to what it was. Nope. No luck. This is likely going to cause some people a lot of angst. I, however, just roll with the punches. And I'm in. Holy smokes! 280 people on the Imperial Fleet? I've never seen so many people in one place! You'll also notice the Legacy symbol in the toolbar is lit. Since I had no characters on this server, I needed to create my legacy as if it were the first time. I'm not sure what would have happened if I had a legacy character on the destination server already. And there we go. Darth Macshadey Caldera of Fatman. For me the process was pretty painless. Your mileage may vary. No doubt for those of you who have much more invested in your characters, the chance that you will have to rename them might bother you. You may also have some additional baggage in the way of your legacy, guild affiliations and... well... actual baggage (inventory). Hopefully this helped to satisfy your curiosity.